The Square-2 puzzle is a cube that consists of three layers. The top and bottom layers are cut radially like a pie into 12 parts, each 30 degrees wide. Some of the cuts go through the vertices of the square, so along each side of a square outer layer there are three pieces. The middle layer has a single cut from the front left to the back right, separating it into just two pieces. You can rotate the top or bottom face any multiple of 30 degrees, and you can twist one half of the puzzle along the middle layer cut which exchanges 6 pieces from the top layer with those on the bottom layer. The puzzle is stickered so that each face of the cube is a different colour. This puzzle is essentially an unbandaged version of the Square-1 puzzle, and was first made by David Litwin. There are two mechanisms for this puzzle. The first mechanism was based directly on the Square-1 where the pieces are slotted onto a fixed rail attached to the middle layers. The improved mechanism has springs that make it less rigid, smoother, and much more forgiving to minor misalignments. We will use one of the middle layer halves as our reference point. The other half can be can be correct or flipped, so has 2 possible states. The 24 pieces in the top and bottom layers are all different, and so can have at most 24! possible arrangements. This gives a maximum of 2·24! = 1,240,896,803,466,478,878,720,000 positions. All these are actually achievable. 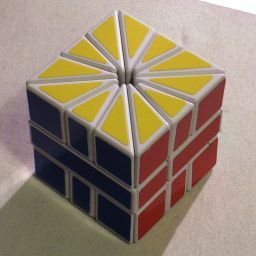 Note that there are two solved positions, as it is possible to swap the top and bottom face colours. Hold the puzzle with the "Square-2" logo on the left. This left half remains fixed and serves as a reference point. Twisting the right hand side of the puzzle by a half turn is denoted by the letter R. A clockwise turn of the top layer by one piece (30 degrees, 1/12 of a turn) is denoted U, and similarly a clockwise turn of the bottom layer is denoted D. Anti-clockwise turns are denoted by U' and D'. The letter can also be followed by a number to indicate how far to turn, for example U6 is a half turn of the top layer. Phase 1: Solve the bottom and middle layer. Choose which of the two outer colours you want the bottom face to have. Place one piece with that bottom colour in the left half of the bottom face. This piece is considered to be solved, and the following steps will solve adjacent pieces one by one to build up the solved section of the bottom layer until the whole layer is solved. Find the piece that belongs adjacent to the right of the solved section. If necessary, check the colours of the middle layer to figure out which piece that is. 1. Turn the bottom layer until the piece you want to move is at front, just to the right of the middle layer seam. 2. Do R U' R U' R U R.
Turn the U layer to bring the piece to the back of the right half, directly to the right of the middle layer seam. Turn the D layer so that the solved section lies just to the left of the front middle layer seam, with the unsolved section to the right of the seam. If solved region has 6 or fewer pieces, then you can simply add the next piece to it with an R move. Otherwise you can do the move sequence R U' R U' R U R. This is the same sequence as in step d.
Repeat steps c-g until the bottom layer is solved. If the middle layer is not solved, then do R U6 R U6 R.
Phase 2: Solve the top layer. The top layer will be solved by only swapping adjacent pieces. By repeatedly swapping one particular piece with whatever piece is to its right, you can move that piece all around the top layer until it is in the spot you want. Find two adjacent piece in the top layer that you would like to swap in order to bring the layer closer to being solved. Turn the top layer until the pair you want to swap lies at the front, one on either side of the middle layer seam. Do the move sequence R U' R U D R D' R to swap the two pieces. This will also swap two pieces in the bottom layer, but ignore that for now. Repeat steps a-c until the top layer is solved. If the bottom layer still has two pieces swapped, then you need to take any piece in the top layer and swap it in one direction 11 times so that it travels past all the other pieces and ends up back where it started. U11 D1 R U3 D3 R U3 D9 R U9 D9 R U7 D11 : Swaps the colours of the U and D faces, switching between the two solutions.